This is the online supplement to my article "Balanced Cable Hum: Cause and Cure", appearing in the May 2009 issue of audioXpress magazine. It turns out that a simple wall outlet adapter can inject a signal that is 20 dB or more above the noise floor. After reviewing the theory of magnetic induction, I identify several possible solutions. The most attractive solution is the star-quad configuration which is now becoming available. However, the XLR connectors on the end of every mic cable are efficient hum antennas, no matter how good the cable itself is. 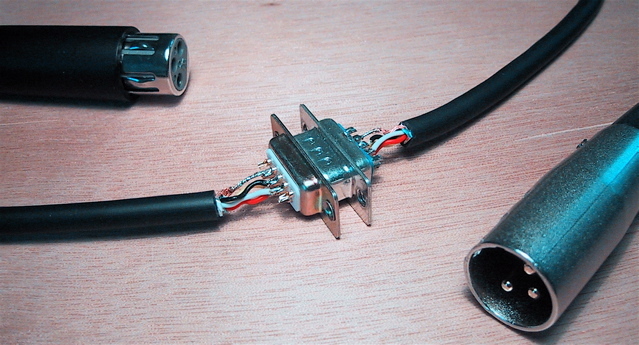 I therefore call for a new standard for microphone connectors, and list the requirements for such a connector in the article. 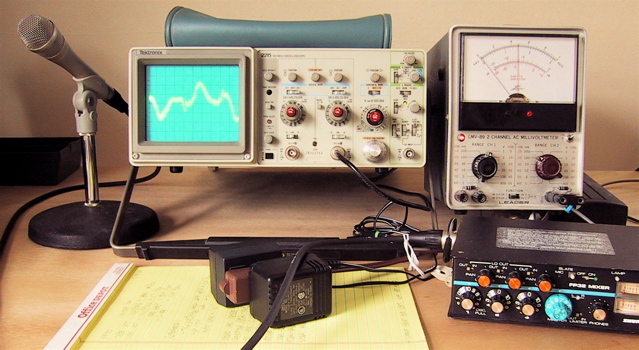 You can see clearly on the oscilloscope the 60 Hz hum plus harmonics being injected into a balanced mic cable, far above the noise floor, from the wall outlet adapter in the foreground. I used Apple Grapher (freeware that ships with all current Macintosh computers) to render the image of a twisted pair in this figure. Here I show the image in color, so you can see what it looks like. Red and Blue each represent one side of the balanced line. If you want to see how the image is generated, you can download the Grapher file here: one.gcx (1.5 MB). My server doesn't know what to do with this extension, so just right-click to save the file on your desktop, check that the extension is still '.gcx', and open in Mac Grapher. This figure was also rendered using Apple Grapher. In this case, the colors are more important in order to see how the doubly balanced pairs are connected. Red and Black represent one side of the balanced line, and are connected to each other at both ends of the cable. Blue and Yellow represent the other side of the balanced line, and they are also connected to each other at both ends of the cable. To see how the image was generated, you can download the Grapher file here: three.gcx (3.1 MB). Photo 2 in the article shows how I inserted a mating pair of DB-9 computer connectors in the middle of a star-quad mic cable, to test hum pickup of connectors other than XLR types. While I'm not recommending DB-9 connectors for this application because they wouldn't stand up to rampant abuse in the field, the improvement as described in the article was dramatic. The following table gives the pinouts I actually used for the test. My first choice would have been an XLR or Canon connector with more pins, but all the types I could find have the pins arranged in a semi-circle or arc, so you can't find pairs of pins that have a common center. Lemo makes a broad line of connectors that I believe would be ideal, although quite expensive, for this application. In their B-series for instance the pins are uniformly spaced along concentric circles, so it's easy to find combinations of pins that provide a magnetically concentric balanced pair. Canare Corp. provides star quad shielded cable which can be used for microphone cable assemblies. These can be ordered, for instance, from Full Compass Sound under various brand names. I haven't tested them, but they seem to be on the right track. A closely related issue with balanced mic cables is what to do with pin-1. Current manufacturing practices obscure the distinction between signal ground and chassis ground in audio equipment, leading to confusion about the purpose of having the shield in a mic cable connected to pin-1 of the XLR connector. Rane Corporation has a detailed white paper that sorts out this dilemma. At the end of my article, I mention the possibility of using triaxial cable for balanced audio connections. The inner conductor and first shield would certainly form a magnetically concentric pair, but they wouldn't be balanced, in the sense that series resistance and capacitance to ground would be different for the two conductors. I don't know how this would play out in real-world applications, but it would be interesting to find out. I have already used triaxial cable for a different purpose, to reduce the input capacitance of a musical instrument direct interface (DI). For reader's convenience, I list here the references given in the article, with URL's linked as available. Bill Whitlock, Answers to Common Questions About Audio Transformers, Jensen Transformers, Inc. Application Note AN002, 1995. See Wikipedia for a paragraph about the Star Quad Configuration. They have a nice illustration at Star Quad Picture. Canare maintains a document on The Star Quad Story with more details.